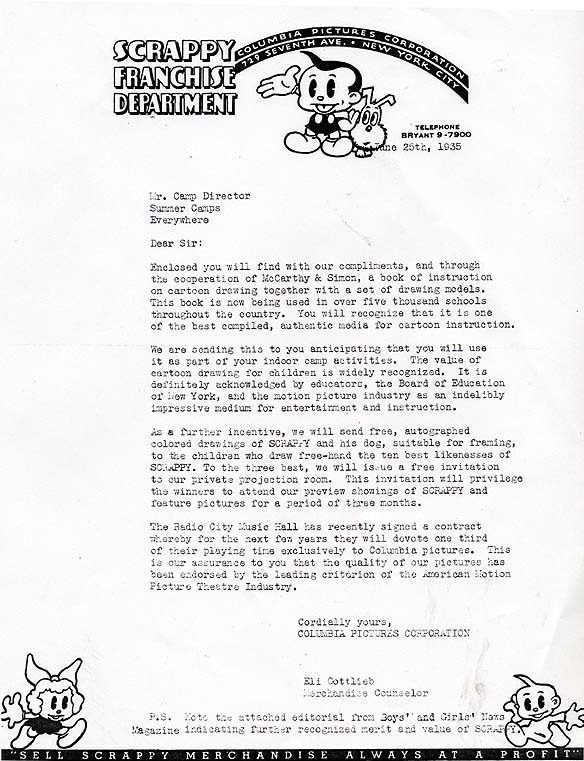 Therefore, he was enclosing an instructional booklet on cartooning, along with “drawing models” (which happened to be of Scrappy). In a major competiton, autographed pictures of Scrappy (“suitable for framing”) would be sent to the ten children who drew the best likenesses of him. The three best Scrappy portraits would win visits to Columbia’s “private projection room” to preview Scrappy cartoons, as well as feature films, for three months. Radio City Music Hall had recently agreed to devote one-third of its playing time to Columbia films (presumably including Scrappy cartoons). The Boys & Girls’ News magazine had recently published an editorial that apparently spoke approvingly of Scrappy. Are any of the fortunate small fry who won private Scrappy screenings still with us? Do they remember any of this? What other activities did the Scrappy Franchise Department engage in? Did they also involve deadpan explanations of the educational value of Scrappy? Wouldn’t the world be a better place if Radio City Music Hall still showed Scrappy cartoons from time to time? I wish they showed Scrappy on Boomerang or TV Land (or whatever the Retro cartoon channel is called now). These were the innovators of cartoons and should be seen by all generations!